The storm has now been raging for hours and Leif’s vessel is on the verge of sinking. He can only pray that the storm will stop soon, or it will be a long hike home. Link to Gallery with more pictures. Nice job! I like your boat and water especially, the campfire also looks nice. Brilliant scene!! I love the snow effects! Your water looks awesome with some blue and light blue mixed in. Sweet! really like the boat! I love it ... good job. The listing ship is great, and I love the snowscape. j/k, this is really well done and I like how Garhim lends itself to more unconventional scenes like this. Nice job, Eklund. Nice story also. We definitely have some great entries for this first Local Challenge! Great job all around. 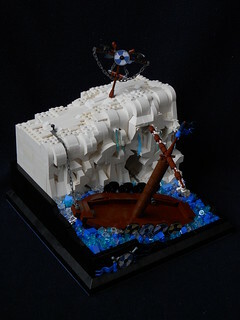 I really enjoyed the detail on the snow cave, the icicles and the rough water. Quick question: how many 1x1 rounds do you think you used? Do you think 100 would be enough to do something of similar size? Obviously, Eklund can answer that better than I, but I'd guess 100 is probably about what he used in this MOC, since he also mixed in some standard blue bits and some clear cheese slopes. Congrats to Eklund on winning Garheim's LC1. There were a couple of others that we were considering, but the way you captured the feel of a boat tossing in rough seas helped to tip the scales in your favor. Nice job. soccerkid6 wrote: Quick question: how many 1x1 rounds do you think you used? Do you think 100 would be enough to do something of similar size? Luckily, I still had this together and was able to count the small rounds. I used 96 trans-light blue round plates and 98 trans clear cheese slopes. However, in builds like this and this, I used significantly more. 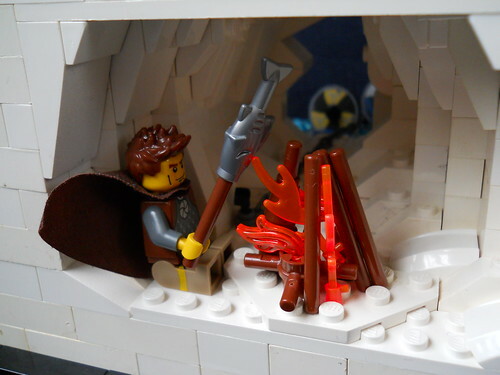 100 hundred should be fine for this size of this moc though.